Because they ridiculed the Islamic prophet, 12 employees of the French satire magazine Charlie Hebdo were killed in an organized military-style attack on its office in Paris by three terrorists with military weapons. In another event, a gunman entered a kosher grocery in the city and took several people hostage. In all, 17 innocent persons were murdered in the violence. The AP reported the following item on January 9 that was not widely published: “Hundreds of bodies – too many to count – remain strewn in the bush in Nigeria from an Islamic extremist attack that Amnesty International suggested Friday is the ‘deadliest massacre’ in the history of Boko Haram.” One official said most of the victims were children, women and the elderly, who were unable to run fast enough to escape the savage attack. The U.S. is quite familiar with Islamic terrorism, but over the years since September 11, 2001 the level of violence of subsequent episodes of has blessedly not been on the same large scale as the 9-11 attacks, which killed nearly 3,000 innocents. Which is not to say it has been a level that we can, or will, accept. Radical Islamic terrorism is a subject many prefer not to address. To some, it is like whistling past the graveyard; if we ignore it, maybe it will go away. Still others refuse to confront it for the reality that it is. But Islamic terrorism is a growing problem in our world, perhaps the most serious thing we have to face. Certainly, it is an urgent problem. Muslim terrorists finally have done something that produced a substantial response. 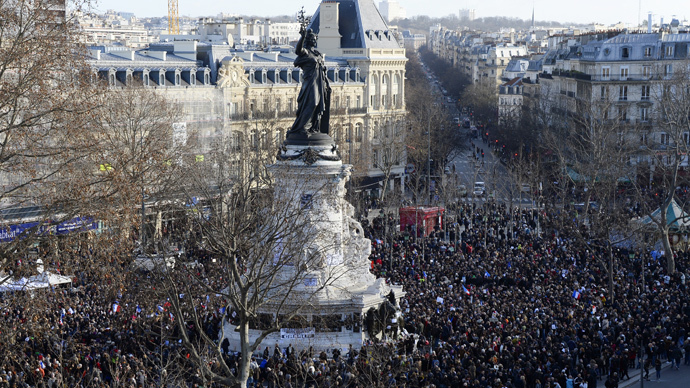 A huge group gathered in Paris to commemorate the victims of last week’s terrorist activity at the hands of Islamic radicals and to show solidarity against terrorism. Reports put the total number of participants between 1.5 million and 3 million. Among those attending were 40 world leaders, among whom were French President Francois Hollande, German Chancellor Angela Merkel, British Prime Minister David Cameron, Italy's Matteo Renzi, Mariano Rajoy of Spain, Ahmet Davutoglu of Turkey, and Jordan's King Abdullah II and Queen Rania. Notably, both Israel Prime Minister Benjamin Netanyahu and Palestinian President Mahmoud Abbas were there. Conspicuously absent was the leader of the free world, President Barack Obama. Instead of joining the other world leaders who were able to make the trip, Mr. Obama stayed home. Attorney General Eric Holder was in Paris, not for the march, but was meeting with Bernard Cazeneuve, the French Minister of the Interior. U.S. Ambassador to France Jane Hartley did participate in the march. Where were senior cabinet members, like Secretary of State John Kerry, the most senior cabinet officer? Mr. Obama did find the time to visit the French Embassy in Washington, sign a book of condolences, and speak with diplomats last Thursday, and at a Friday appearance in Knoxville, TN he expressed solidarity with the people of France, and offered assistance. This behavior is in keeping with Mr. Obama’s proclivity for avoiding any connection to the term “Islamic terrorism,” in either word or deed. While nearly everyone else notes that the terrorists are “radical” Muslims, and that the radical element is only a fraction of the more than 1 billion Muslims wordwide, Mr. Obama refuses to connect these terrorist acts to Islam at all, saying that Islam does not allow such brutality. Whatever the basis of Mr. Obama’s reluctance to adequately identify these acts as those of radical Muslims – he called the killing of 13 U.S. military personnel at Ft Hood by a Muslim psychiatrist praising Allah “workplace violence” – Egyptian President Abdel Fattah el-Sisi, himself a Muslim, has no such reluctance. As reported by CNN, President el-Sisi has called for a "religious revolution," asking Muslim leaders to help in the fight against extremism when addressing the group during the celebration of the birthday of the Prophet Muḥammad. "I say and repeat, again, that we are in need of a religious revolution. You imams are responsible before Allah. The entire world is waiting on you. The entire world is waiting for your word ... because the Islamic world is being torn, it is being destroyed, it is being lost. And it is being lost by our own hands," he said. If Islam is a religion of peace, if Islam does not endorse the sort of barbarism demonstrated in these and other terrorist attacks perpetrated by people claiming to be Muslims, then Islam has to take the lead in putting an end to it. The United States must insure that Muslims are treated like everyone else in the U.S., and not give them special treatment, good or bad. We have to take a much more proactive role in wiping this scourge from the face of the Earth by rooting out the terror cells in America and focusing on the hotbeds of Islamist extremism around the world.